UNITED NATIONS, Apr 10 2017 (IPS) - Pakistani education activist Malala Yousafzai has become the youngest UN Messenger of Peace with a special focus on girls’ education. During a designation ceremony, UN Secretary-General António Guterres selected and honoured Yousafzai as the organisation’s Messenger of Peace. “You are the symbol of one of the most important causes of the world…and that is education for all,” said Guterres. 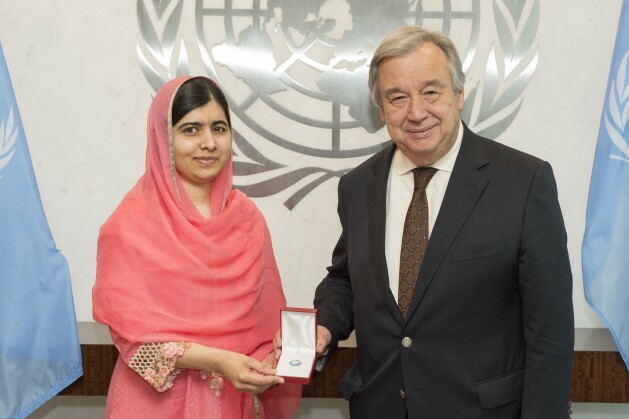 “Admiring your courageous defense of the rights of all people including women and girls to education and equality [and] honoring the fact that you have shown, even in the face of grave danger, the unwavering commitment to peace…it takes great pride and pleasure in proclaiming Malala Yousafzai a United Nations Messenger of Peace,” he continued. Yousafzai, 19, became a symbol for the fight for girls’ education after being shot in Pakistan’s Swat valley in 2012 for opposing Taliban restrictions on female education. She has since become a global human rights leader, becoming the the youngest-ever Nobel Peace Prize laureate and co-founding the Malala Fund to raise awareness of the millions of girls without access to formal education. “I stood here on this stage almost three and a half years ago…and I told the world that education is a basic human right of every girl…I stand here again today and say the same thing: education is the right of every child and especially for girls, this right should not be neglected,” Yousafzai said upon accepting the role. Most recently, Yousafzai condemned the U.S. executive order banning people from several Muslim-majority countries, writing that she is “heartbroken” and asking President Donald Trump to not turn his back on families fleeing violence and war. “I’m a Muslim and I’m proud to be a Muslim… I think people should look at me and all of the other 1.6 billion Muslims who are living in peace and believe in peace rather than looking at a few terrorists…they are not us,” she said during the designation ceremony. Both Yousafzai and Guterres noted the challenges that refugee families face in camps. Worldwide, approximately 50 percent of refugee children have access to primary education. The gap widens as children grow older with 22 percent having access to secondary education and less than 1 percent with access to universities. In Lebanon alone, only half of Syrian refugee children can go to school. “This shows how little the international community is doing to educate refugee children,” said Guterres. “It is our responsibility, especially in the richest countries, to express our solidarity to all those who unfortunately cannot provide to their children the education they have the right to receive,” he continude. The Malala Fund helps fund schools around the world, including education programs in the Za’atari and Azraq refugee camps in Jordan. Messengers of Peace are distinguished individuals, carefully selected from various fields by the Secretary-General, to help raise awareness on the work of the UN. Others Messengers of Peace include U.S. actor Leonardo Di Caprio, Brazilian writer Paulo Coelho and U.S. singer Stevie Wonder.